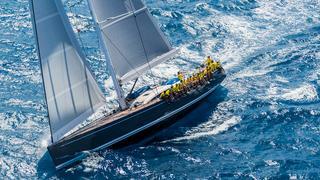 The first day of racing at the Loro Piana Caribbean Superyacht Regatta & Rendezvous 2016 didn’t disappoint as the 21-strong fleet enjoyed sunshine, blue skies and brisker than usual north-easterly winds. At the conclusion of four hours of challenging racing, winners in their respective divisions were the 34 metre Nilaya (Class A), the 46 metre Unfurled (Class B), the 59-metre Seahawk (Class C) and the 28 metre Freya (Class D). However, with two days still to race at the event organised by the Yacht Club Costa Smeralda (YCCS) and Boat International Media, there's everything still to play for. Conditions could not have been more thrilling for the competing yachts and the many spectator boats that turned out on the race course. 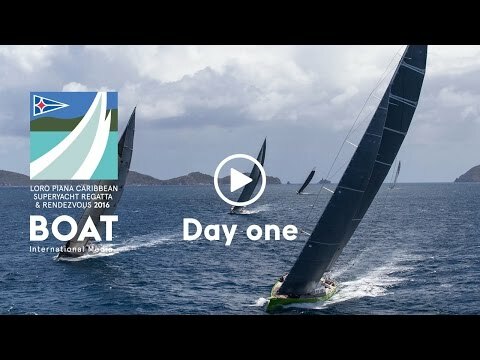 In northerly winds of 18 to 22 knots the YCCS Race Committee sent the fleet on a clockwise circumnavigation of Virgin Gorda which brought Classes C and D straight around the island on a 25 mile course while Classes A and B swung out to leave the isle of Ginger and the rocky Dog Islands to starboard — covering almost 30 miles in total. 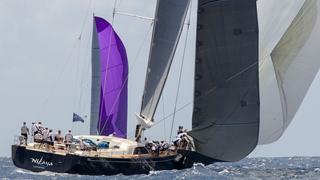 After an initial upwind beat and a squall that pushed the breeze to the right, the yachts rounded the northern tip of Virgin Gorda, navigating outside the reef system and dealing with a channel of rough seas before raising their spinnakers for a long downwind run where some of the performance-oriented Class A yachts hit speeds of 18 knots. As expected, given the event’s pursuit format start — which sees the slower yachts set off first with the faster boats making up time around the course — the final beat to the finish saw the fleet growing closer with each tack. The crew of Nilaya worked overnight to resolve an engine problem in time for today’s starting signal, and went on to win with a healthy delta ahead of Marco Vogele’sInoui in second and racing machine Samurai in third in Class A. In Class B the newly launched Vitters yacht Unfurled pipped the 60 metre modern classic Hetairos to the post while last year’s overall winner P2 took third place. The team on Class C winner Seahawk will be hoping to repeat their stellar performance tomorrow, despite having blown their spinnaker in today’s race. “The wind was pretty much what was forecasted. For us more breeze is always a little bit better. On the downwind leg we sailed very well. We didn’t do a lot of practising with the kite up because of the heavy breeze in the days before the regatta and it blew up today. It only blew up at the very end of the last spinnaker leg so it didn’t affect our performance too much. I doubt whether we will have a new one for this week. We are working on solutions at the moment for getting a new kite or a repaired kite,” commented Captain Gerhard Veldsman. In Class D practice paid off for the Swan 90 Freya who led Maegan and Blues across the finish line. Tactician Mike Toppa explained the tactical decision behind today’s success: “Today was a really nice day: nice and windy, flat water. The committee did a really nice job of predicting the sea state and the wind velocity and sent us on a really nice course around the island. Owners and their guests will attend the Loro Piana Owners’ Dinner this evening at the YCCS Clubhouse, where they will be treated to a performance by virtuoso British pianist Oliver Poole. Teams, meanwhile, will kick back and catch up on the day’s events at the Crew Party at nearby Bitter End Yacht Club. Racing is scheduled to continue tomorrow at 11 a.m. with winds forecast to strengthen to 20-22 knots and move slightly eastward. For more from today's action don't miss the top race photos from day one of the Loro Piana Caribbean Superyacht Regatta & Rendezvous 2016. The Westport Rendezvous, which counts seven motor yachts and one sailing yacht, will get underway in earnest tomorrow with a cruise in company to take in the start of racing and a visit to the nearby Scrub Island Resort and Spa planned. Keep up with all the action via the Boat International website or follow the event on social media using #loropianasyr on Instagram, Twitter and Facebook.